Today is National Gumdrop Day. How odd to think that the day after Valentine's Day would be a day to celebrate yet another piece of candy. Most of us have chocolate hangovers and couldn't begin to think about eating more candy. Yet, the candy makers wish to push even more candy upon us. Better wash it all down with a strong craft beer while you're at it. Here's what's happening around the Colorado beerosphere today Friday, February 15th, 2013. Denver Beer Co (Denver) - Here's a great event to wake you up on a Saturday morning. On Saturday, February 23rd from 9:00AM to 12:00PM it's the Beer, Bacon & Coffee Fest at Denver Beer Company. Come warm up and indulge all of your vices at the Beer, Bacon & Coffee Fest at Denver Beer Co. Last year was such a blast, we decided to team up with some Denver’s finest. A few from last year and some new friends as well. For $30 a ticket you will receive a breakfast burrito from Chile Billy, coffee from Coda Coffee, all-you-can-eat bacon from chef Justin Brunson’s new company Denver Bacon Co. You will also receive a souvenir mug to fill with all the “breakfast inspired” brews you can drink from Denver Beer Co. Call for tickets (303-989-1253) or drop by the taproom to reserve your spot. De Steeg Brewing (Denver) - There's a new beer on tap that will be taking over for the drained Imperial Pumpkin. De Steeg now has their French Saison on tap. They hope to get their Imperial Pumpkin back on as soon as possible. Also, look for their upcoming Double IPA to be tapped sometime around March 1st. Business has been so good so far that they are ordering 4 more fermenters and will eventually have up to 8 taps available. Hops & Pie (Denver) - Coming up on Saturday, February 23rd starting at noon it's another in the continuing series of Denver's Littlest Big Beer Fests at Hops & Pie. 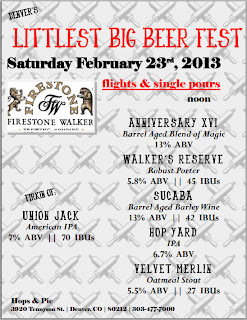 February's feature brewery will be Firestone Walker Brewing Company of California. 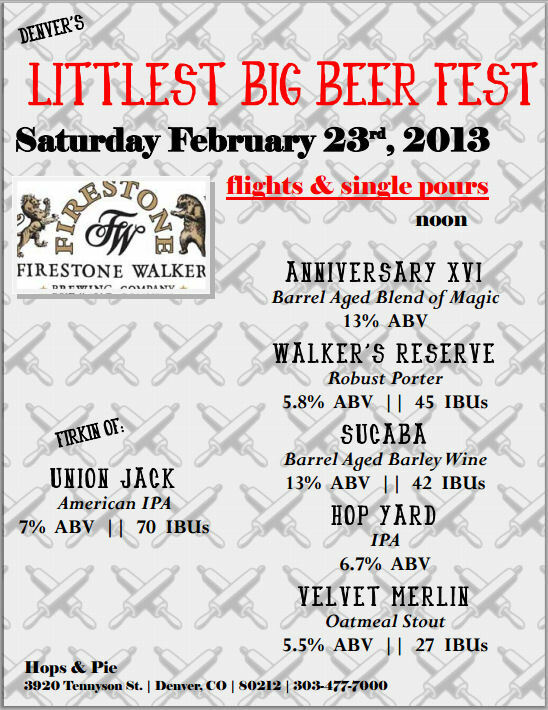 Stop in anytime after 12 noon and you can order flights or single pours of one of six different Firestone Walker specialty beers including a firkin of Union Jack American IPA. Also on tap will be FW Anniversary XVI, Walker's Reserve Robust Porter, Sucaba Barrel Aged Barley Wine, Hop Yard IPA, and Velvet Merlin Oatmeal Stout. Grab some good food and enjoy some of the best craft beer in the region. Located at 3920 Tennyson Street in Denver, CO.
Vine Street Pub & Brewery (Denver) - As part of their month-long Stout Month, they are releasing the KRAKEN, their 2013 Home Brew Winner. This English style stout with Kraken rum-infused oak spirals has incredible notes of vanilla and spice. Stop in soon to try a pint. Falling Rock Taphouse (Denver) - Pliny the Younger will be tapped at Falling Rock on two consecutive Saturdays, February 16th and February 23rd. Doors open at 11am tomorrow and PtY will tap around 1:00pm. Read all about it on the official website posting. Oskar Blues (Longmont) - It's the Tasty Weasel's 4th Year Anniversary Party. It's happening this Saturday, February 16th from 4:00pm to 11:30pm at the Tasty Weasel Taproom. They've been wettin' your whistle for FOUR YEARS and it's time to party. They'll be pouring plenty of Oskar Blues beers, including tons of specialties on tap, Oskar BlueSkee Ball tournament, Bonewagon Food Truck, and Strategic Beef Plan, our homegrown band! Play Specialty Beer Bingo at the Weasel all this week - first 43 people to get BINGO! get to line up for a pour of their special Tasty Weasel Anniversary Beer. Wanna hint?? It's has a lotta HOPS in it! Live music from Strategic Beef Plan. City Star Brewing (Berthoud) - Today City Star is tapping their Up All Night Watchman - a robust coffee stout. It taps at 5:00pm just in time to kick your Friday night into high gear. Stop in for a taste and stay for the live music from BlueKrewe Duo at 6:00pm. High Hops Brewery (Windsor) - This coming Tuesday, February 19th, sign up for the High Hops Beer Dinner over at Choice City Butcher & Deli in Fort Collins. There will be 5 beers, 4 courses and a great time. 1st beer pours at 6:30pm and 1st course is served at 7:00pm. Cost is $55 per person and is guaranteed to be awesome! Sign up at Choice City - 970.490.2489. RSVP only. Tonight at the brewery - stop in for a brew and listen to live music with Joel Kachel. Grimm Brothers Brewhouse (Loveland) - At noon today, Grimm Bros will be releasing their Old Sultan - a Munster Altbier. It's a malty light amber colored ale, brewed with a touch of mild sourness and a refreshing hop profile. Chaulkboard Gourmet Express is also on hand for lunch. Get $1 off all pints until 3:00pm today. The Mayor of Old Town (Ft. Collins) - In the land of 100 beer taps - The Mayor is getting ready to award $500 in their 1st Annual Farkel festival & tournament tomorrow, Saturday, February 16th at 1:00pm. Come in and roll the bones! This festival is sponsored by Funkwerks. Odell Brewing (Ft. Collins) - In a collaborative effort with Mountain Sun Brewery and Cranknstein (coffee shop/bar in Ft. Collins), Odell is tapping a Java Belgian Russian Imperial Stout collaboration beer called "Mutual Respect". Come try this beer at Odell, Cranknstein or Mountain Sun for Stout Month. New Belgium (Ft. Collins) - Something different will be tapping only in their tasting room today. It's a firkin of Sunshine Wheat infused with smoked apples. It tapped at noon today so better hurry over to try some. Bristol Brewing (Colorado Springs) - This Saturday is cask Ale Saturday at Bristol. Grab a pint of their Winter Warlock Oatmeal Stout aged with habanero, coconut and pineapple. This cask is sure to drain quick. It taps this Saturday at noon. Then stay for live music from John Stone from 3pm to 5pm. Want a tour of the brewery? Get one every Saturday (except Feb. 23rd) hourly from 2pm to 4pm. Crazy Mountain Brewing (Edwards) - Business is good. So good in fact that Crazy Mountain is planning to build a 2nd brewery somewhere in the Denver area by the end of 2014. In addition to a brewery, Crazy Mountain is also looking to open a restaurant in as well. During 2013, Crazy Mountain anticipates to more than double their number of barrels brewed up from 6,100 barrels in 2012. They also wish to expand nationally and building a 2nd brewery will help them do that. Stay tuned for more details on their proposed Denver expansion as it unfolds. Also - don't forget this weekend is Winter WonderGrass festival at the brewery. 1-day passes available in the tasting room for $40 (Saturday) and $35 for Sunday. Ska Brewing (Durango) - Ska is giving away a sweet Mole Stout branded snowboard tomorrow from Venture Snowboards at Purgatory at Durango Mountain Resort on the hill. If you drink Ska beers there you'll be entered to win. The Drawing will be at 4:30pm at Purgy's.